The Anchorage Assembly will hear public testimony on the bridge and its potential removal from Anchorage’s Long Range Transportation Plan on Tuesday, June 16 at the Assembly meeting that evening. “The results of the review indicate that there is a 90% likelihood that the range of all costs (e.g. construction, contingencies, support, environmental mitigations, engineering, utilities, right-of-way, tolling, etc.) for the entire Project will be between approximately $1.5 billion and $1.6 billion. For Phase 1 [i.e., connecting to A/C Streets and a 2 lane bridge], the 90% likelihood is between approximately $670 million and $740 million. 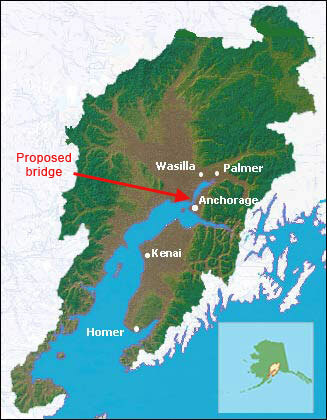 For Phase 2 [i.e., connecting to Ingra-Gambell and a 4 lane bridge], the 90% likelihood is between approximately $750 million and $920 million. For Phase 2, the review team had to develop assumptions for construction work that could be scheduled between 10 and 20 years out. For Phase 2, especially, the impact of cost escalation is the largest factor in the variability of costs.” (p. 3). Please click here to view the April 22, 2009 memo. You can view the state’s summary here [Dead link- this document is no longer online.]. To view a 2/10/09 ADN story on this topic, please click here [Dead link- this story is no longer online.]. Please click here to see an analysis of the survey. Please click here [Dead link- the KABATA web site is no longer online.] 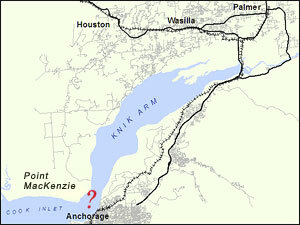 to get the survey report from the Knik Arm Bridge and Toll Authority. This PDF document contains KABATA’s responses to questions initially posed at the AMATS Policy Committee meeting on June 12, 2008. To view the April 22, 2008 Alaska DOT letter, please click here. To view KABATA’s response to the Alaska DOT letter, please click here. To view KABATA’s answers to the Alaska DOT letter based on the February 2008 draft public-private partnership Request for Proposal, please click here. To view supplementary letter information such as design and cost estimates, please click here.